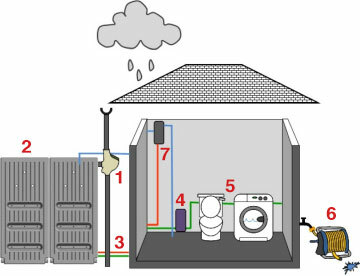 A rainwater harvesting system is connected to services and appliances to use rainwater for toilet flushing, laundry and garden irrigation. Rain falling on the roof of a building is channelled via the existing gutters and down pipe to a filter which removes leaf litter and other debris before diverting the water into a storage tank. When an appliance demands water a pump is automatically activated and draws water from the tank or a header tank dependent on the type of system employed. Rainwater utilisation should be a practical and affordable conservation measure for all buildings. It takes energy to retrieve and clean water for your building it takes energy to supply water to your building, why not use water that falls from the heavens to help you save money and reduce your carbon footprint at the same time. 1 Rainwater filter, diverter, tank overflow and back flow prevention. 2 Rainwater tanks with steel support frame. 3 Insulated tank outlet and cable to float switch. 4 On demand wall mounted pump package. 5 Rainwater main to services. 6 Garden watering via rose gun. 7 Mains top up valve connected to float switch at the tank base.